Courtesy of the Centre for Newfoundland Studies Archive (J.R. Smallwood Collection 075, Photo 5.05.278), Queen Elizabeth II Library, Memorial University of Newfoundland, St. John's, NL. Keough attended St. Bonaventure's College in St. John's, after which he went on to work in the labour movement as a union organizer and the editor of a labour newspaper. 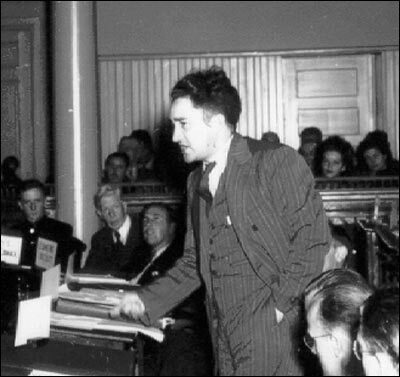 The labour movement in St. John's, like its counterparts in other countries, had a number of socialists and liberals who wanted a fairer deal for the working class. Keough could not help being influenced by these ideas, especially with the poverty and unemployment of people during the Depression. In the 1940s he served as a co-operative field worker on the island's west coast, and he saw first-hand the conditions in rural Newfoundland. He also had some experience trying to make the lives of these people better. His speeches to the National Convention reveal a man who was concerned for the well-being of the average person, or, as he put it, "the last forgotten fisherman on the bill of Cape St. George." He felt that union with Canada offered the best hope of a dependable and decent standard of living for ordinary people. After confederation, Keough served as a cabinet minister in the provincial Liberal government.